Ever since 1992 when the American Academy of Pediatrics instituted the “Back to Sleep” campaign, the incidence of Sudden Infant Death Syndrome has dropped dramatically. In this same time period, however, there has been a huge increase in babies developing flat heads. They are also rolling over, sitting up and starting to crawl later than they used to. This is because babies are spending much more time on their backs, much more time sitting and sleeping in positioners like bouncy seats and reclined rockers, and we are forgetting to give them the chance to build strength in their arms and necks by allowing them to spend time on their tummies. Prolonged pressure on a baby’s skull, either before birth or soon after, can cause a misshapen head known as positional plagiocephaly. When a baby develops a preferred position, the skull will flatten in that area. These little heads can appear asymmetric if they spend a lot of time on one side with the ear, forehead and cheek shifting in response. If the pressure is directly on the back of the head, the skull will widen and appear tall as a result. When should tummy time start? This reshaping due to pressure occurs because the skull is soft and malleable until about 5-6 months of age when a process called ossification begins. As a result there is no time to lose when it comes to starting tummy time. It should begin in the immediate newborn period. Babies should always be supervised during tummy time, they should never be left unattended. If they fall asleep during tummy time they need to be turned over onto their backs and placed on a flat, firm mattress. How long should tummy time last? Brand new babies should have several short sessions on their tummies throughout the day. They may only be able to tolerate a few minutes at first but the amount of time they spend on their tummies should become longer and longer as their stamina increases for a goal of about 90 minutes total over the entire day by the time they are 4 months old. What if tummy time seems like torture? Some parents are reluctant to enforce tummy time because their babies hate it, they spend the whole time bawling their eyes out. Well, exercise is hard but that does not mean you should not do it. Babies who do not enjoy time on their tummies still need to log their prone time. They can do shorter more frequent sessions until they become stronger and more tolerant. 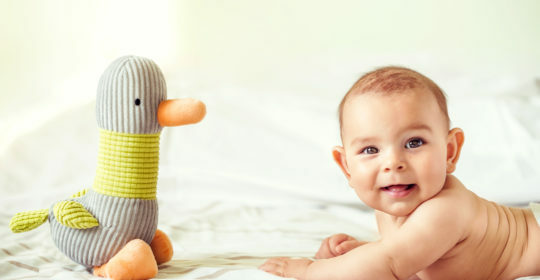 Babies may enjoy tummy time more if parents or siblings get down on the floor with them or give them interesting toys to look at and reach for. Does baby laying on a parent’s chest count? This is the easiest way to start tummy time even before baby comes home from the hospital. Laying a baby across the lap is another way to get the pressure off the back of their heads. Placing baby in a front facing carrier or sitting baby in an upright chair, like a Bumpo, when age appropriate (usually around 3-4 months of age), are other options for reducing pressure on soft, little skulls. Spreading a clean blanket or play mat on the floor and putting babies down on their tummies is the best way for them to strengthen arm, neck and core muscles needed for rolling, sitting and crawling. The key to avoiding flattened heads and delayed milestones is tummy time early and often. If your infant’s skull looks misshapen at or after the 4 month well child exam call us at Potomac Pediatrics at 301-279-6750 to discuss reshaping options, like helmet technology, once the skull starts to ossify.